Kmart is a department store best known for its “blue light specials.” At random intervals, a blue police car light would start flashing to announce a special discount that would last for about 15 minutes. At the height of the blue light special’s popularity, people would practically stampede toward the blue light. Kmart is the one and only place in which a blue light has ever been a signal to go. Even then, it was gimmicky and made people feel as if any trip to the store could turn into Black Friday without warning. What color usually means “go”? It’s green, right? Not so fast. 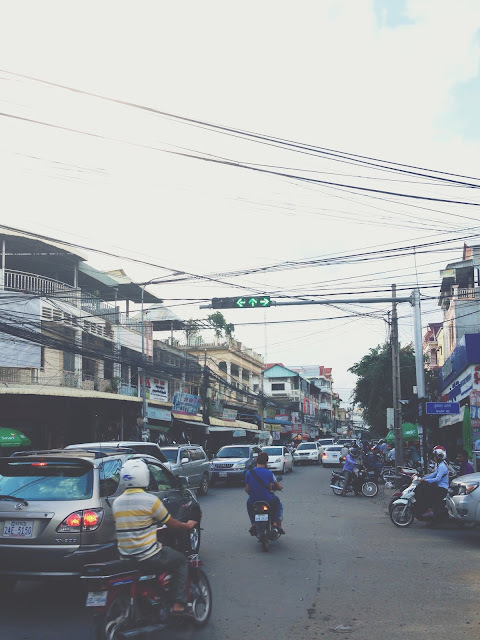 For Cambodian stoplights, red, of course, means stop (at least in theory); yellow, of course, doesn’t exist (no need to muddle things with a confusing middle option, I suppose); and if it’s time to go, the traffic light will, of course, shine blue. These traffic lights appear perfectly green to me, but my Cambodian friends assure me that they are, in fact, blue. This Cambodian preference for calling green things blue runs deep. Tree leaves and grass are also blue. The Khmer word for broccoli translates as “blue cauliflower.” The Khmer language does have a word for “green.” I’ve been told that if a single individual is wearing a green shirt, Cambodians will call the shirt blue. If said individual stands next to someone with a blue shirt on, they will call the same shirt green. Here’s another strange thing. I’ve been raised my whole life to believe that corn is a vegetable. In Cambodia, corn is usually considered a fruit. It is common for people to sprinkle it on their ice cream or to go that extra step and make corn-flavored ice cream. Green is blue. Corn is fruit. Rice is not food. These are but three examples of many in which Cambodians see the world just a little bit differently than I do. The big differences are a shock to the system, but at least you’re expecting them. But when the small differences are stated so nonchalantly and yet contradict things I would never expect to disagree with someone about, it can get to you sometimes. After all, if I can’t be trusted to know the color of broccoli, what can I be trusted with? It works a bit like seasickness. Sometimes I’m fine, but after long enough trying to stand on top of the gentle back and forth of a daily flow that is just different enough from what I’m used to, my system is thrown off balance. If you’re not currently experiencing seasickness, it may seem silly that somebody else would be so thrown off by such gentle waves. Likewise, if you’re not currently experiencing “cultural seasickness,” it may seem silly that I would get moody talking about my rice. This will probably just be my life for the next few years. Sometimes I will really appreciate the insights into life that Khmer culture gives me. Other times, I can experience a different aspect of Khmer culture without letting it bother me. And sometimes, the gentle rolling waves of Khmer culture will catch me unawares and render me moody or snappy or in a funk, etc. for a while before I figure out that the color of grass was behind the whole thing. All of these things are what I have signed up for. When learning the culture becomes hard, I may need to unwind with some ice cream. And yes, I’ll eat it with corn on top. It tastes better than I would have thought.